I had a friend-- I'll call him "Wilson"-- who was... interesting. He was a bit of a conspiracy nut, more than a little paranoid, hated government, was good at outdoor survival skills, had questionable taste in women, and was very stubborn. Yes, he had his flaws (as do we all) but all-in-all he was a decent guy. I always enjoyed hanging out with him. One winter his woodstove was not safe and he couldn't use it. The stove pipe was messed up somewhere above the ceiling. His landlord refused to repair the stove pipe so a fire could be lit. This was the only heat in the house, and it was already winter near Gunnison, Colorado. He told his landlord that he would fix the stove pipe himself and deduct the cost from his rent. The landlord said "no". Wilson wasn't the kind of person to just bite the bullet and fix it at his own expense. So after a bit more arguing over it, Wilson simply stopped paying rent. And the landlord never tried to kick him out. He spent the winter in an unheated house-- which obviously meant he had no running water, either. He was lucky-- I don't think the temperature ever got much colder than 20° below 0 (°F) that winter. He lived diagonally across the river from me, and I went to visit him a few times over the winter. His house was about the same temperature inside as the outdoors. He wore his coat all the time. He slept in one of those "100 below" mummy-type sleeping bags, inside a pup tent, in his bedroom. He said it was warm enough. His house would warm up a little if he cooked something, but that didn't last long and I don't think he cooked much. I offered to let him hang out at my house some, but he didn't want to. He said he didn't want to get used to heat. He would sit at my campfire out by the wikiup with me, though. That was his last winter in the area. 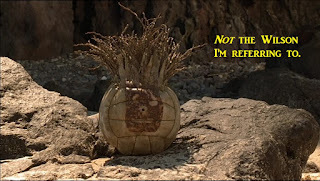 After a few other incidents, Wilson suddenly vanished. Years later I ran into him far from home, while I was on a vacation. He was working in a resort town in New Mexico and I bumped into him on the street. We caught up a little; he told me of more recent incidents, and I got his (general delivery) address. I mailed him a few times, but eventually my letters came back as "undeliverable". I might relate some other Wilson stories another time. There are a lot of them to tell: his clash with the post office, his clash with the sheriff, the time he became convinced I was working with the cops against him, his clash with the forest circus (his term), why he wouldn't use the internet (he would know this is about him, but I know he'll never see it), his pop-up camper incident, his clash with the highway patrol... I notice a pattern here. But not all fit the pattern. If any of those pique your interest, let me know and I'll write it up for another day.